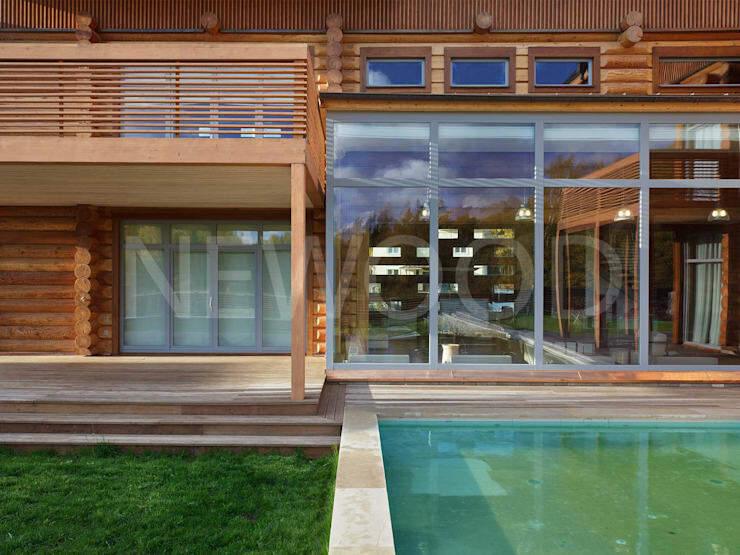 Built by the architects at Newood – Modern Wooden Houses, this sprawling wooden residence is a sight for sore urban eyes. Its lavish proportion and blend of modern and traditional designs invite onlookers to take a closer look. Surrounded by lush manicured lawns and a beautiful pool in the backyard, the property is perfect for relaxing with the entire family. Spacious terraces and large balconies offer ample scope to indulge in outdoor pleasures, while glass doors and windows lend a very contemporary touch to the structure. To find out more, read on. 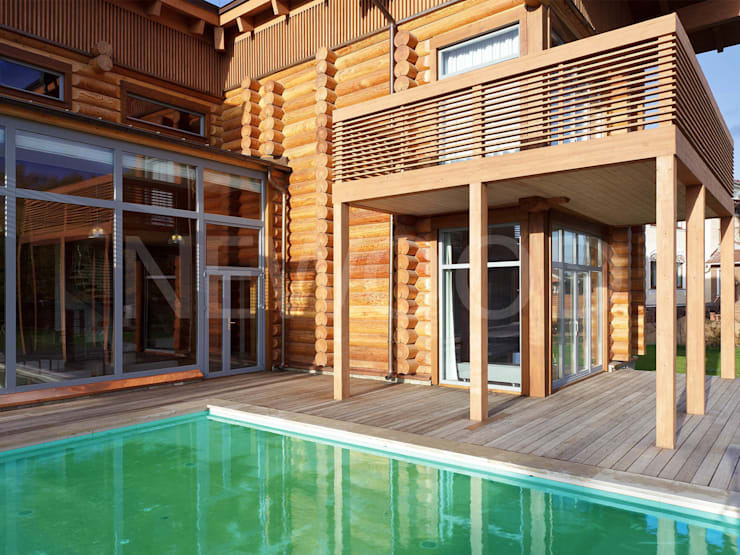 Rich polished wood makes the house shine like a rustic and warm piece of art, while ample glazing on all sides allows sunlight to flood the interiors. The large blue pool and sunny terraces are visible from here. Also note how large and sunny the balconies are, and their stylish balustrades resembling Louvre windows. The slightly sloping roofs make for a very traditional statement here. 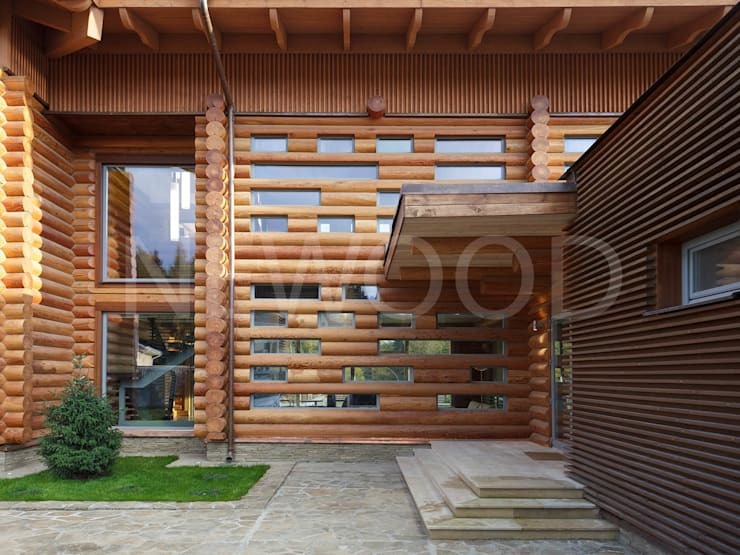 A closer look reveals how wooden logs were put together to create the walls of this building, and they lend a beautiful textured look to the exterior. Sleek columns supporting the balconies contrast the robust feel of the walls. Wall-to-wall glass doors open up the backside of the house to the pool and lawn, besides filling the interiors with sunlight. On the other hand, the large balconies on the upper floor project over the deck of the pool to create shaded spots for outdoor relaxation. Wood lines the deck around the gorgeous blue pool and creates a warm and cosy ambiance for relaxation, parties and picnics. From here, you can also admire the tall and beautiful trees in the distance while the kids play around on the lawn. 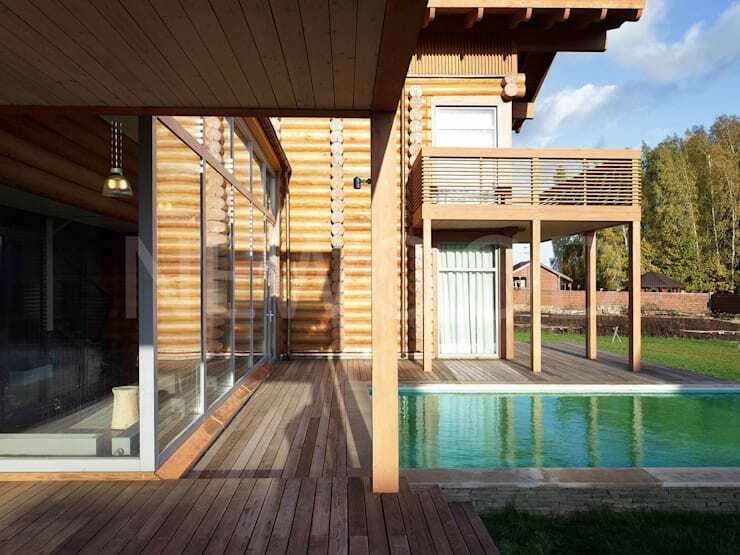 The texture of the wooden logs used for building this house becomes all the more important on the front facade. The entrance is shaded and protects visitors from sun and rain. We particularly love the wall composed of wood and glass; it makes a unique style statement which leaves guests asking for more. 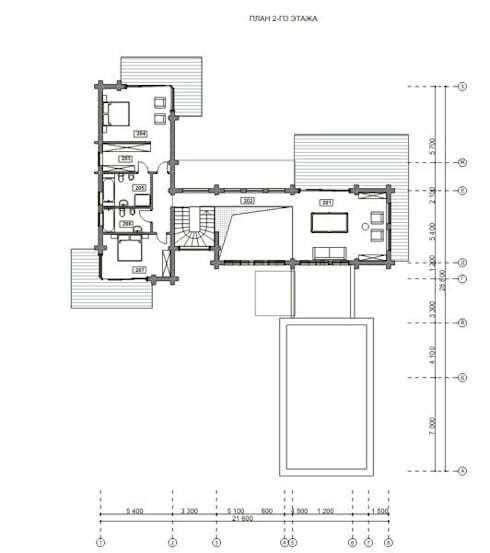 A large garage adequate for two cars, an open plan living area, a large kitchen, a bedroom, a study and a bathroom make up the ground floor of this property. 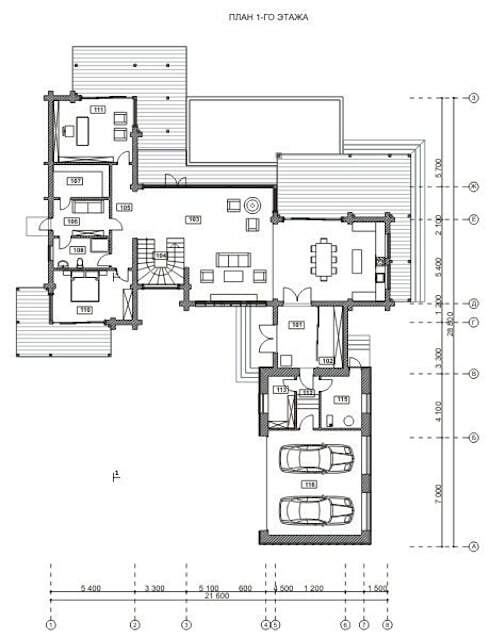 The first floor is relatively smaller than the ground floor, and comprises of two bedrooms, a sitting area and two well-equipped bathrooms.